"Everything is so much simpler - the order is in the kitchen with a single click. The waiters have time to devote to the customers while the drinks are being prepared and served in the meantime." This is just one of the advantages of installing a mobile hand-held EPoS device and we're sure it's also the effective result that every hospitality business strives for, so we've tracked down the product that delivers it - Orderman. Specifically designed to increase efficiency, profits and customer satisfaction, the Orderman was introduced in 1994 as the first mobile hand-held device for the hospitality industry used in stadiums, bars and nightclubs, restaurants, cafes and quick service establishments. Today as part of the NCR Corporation, over 70,000 Orderman units are used in more than 30,000 restaurants across 45 countries worldwide. That's millions of transactions on a daily basis providing better and faster service. Orderman works through radio technology, which is highly reliable over WLAN and Bluetooth and can easily penetrate through solid walls and work over long range while using minimal power consumption. However, as a radio ordering system, Orderman has its own serving method that many traditional restaurants won't be used to. It's not just a case of downing pencils and paper, Orderman is effective by separating restaurant tasks into sales and service. In effect, it introduces a technique of divide and conquer that says goodbye to staff rushing around and to customers waiting. Now that sounds promising. This is how it works. Sales specialists meet and greet customers, take orders and payments, and network among tables to ensure every opportunity is taken to attend to customers' needs. In a single transaction, they can take an order, pay and print a receipt on the spot – ta dah. Mean while they are supported by waiting staff, who are the only ones to collect orders from the kitchen and dispense bar, serve food and drinks to customers as well as clearing and setting tables. The result is quite simply faster, more effective and more profitable. What are the core features? There are eight Orderman models to choose from and each offers a range of features to suit differing hospitality environments. The core features include touchscreen or built-in keyboard, colour-display, bluetooth-interface, messaging functions, a service station, drop proofing, flip view function, autolock, vibra-call, a belt printer connector and a magnetic card reader. The most popular Orderman model is ‘Sol' which is the latest on the market and reported to be of excellent quality with a full colour display, an extremely robust hardware design and a 5 year warranty. Anton Haller, Marketing Manager at Orderman tells us that he thinks Orderman's biggest asset is "making service so much faster by removing traffic from the kitchen. Orders are received in one go with no queue and there are also less false orders caused by poor handwriting. As a result service is faster and guests get their food quickly; it even creates time for guests to place more orders and all this adds to more turnover for your restaurant." Do you know how many orders are missed or wasted, because waiting staff are just too busy to notice or write legibly? It's a very uncomfortable figure believe me. Having the time to enter the correct order or pay more attention to guests' requirements means that the kitchen won't waste food and staff will pick up on all the little extra orders that added together create a lot more turnover. That extra side order, top up of wine or end of meal coffee will really make a difference to your revenue. In fact, Orderman reports that projected over the year, individual diners having an extra item increases sales by at least 10 percent. The next benefit is an easy one, more customer satisfaction. Guests come to a restaurant to enjoy good food, good drinks and excellent service in their company, and that's what Orderman strives to achieve. Orders are taken and served quickly, there's no waiting for the bill, because it is printed directly at the table from an Orderman hip printer, and it can be split as many ways as necessary. Orderman also reports that walking is reduced by up to 40%, which means sales staff can serve 25% more guests on average. Mr Harry Niazi, owner of Olleys Fish Experience, London tells how he improved customer service with Orderman, "In the past, the waiters took the orders and then queued for ages at the cash registers while other customers had to wait for service. It was ridiculous so much valuable time was lost like this. 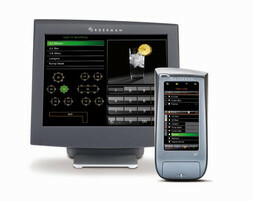 Today we use Orderman, which makes the entire procedure much more flexible and effective. At first sight, the purchase of the handhelds was a major investment – but it paid for itself within a year." Now let's look at the simple benefit of replacing a hand written order pad with the more convenient design of Orderman. A spilt drink, wet surface or hand dirtied by food generally leads to smudged orders. Combine this with a busy service and not only do you have aching wrists from constant scribbling, but also unreadable orders and the potential for mistakes. Orderman devices are specifically designed for the hospitality industry so they are light, easy to use, robust and work in or outside. Our final thumbs-up is more communication between sales and service staff, and the kitchen, creating faster service. Whereas traditional EPOS methods require waiting staff to return to the till to input orders, with Orderman the order is sent directly to the kitchen with no time wasted. According to Orderman, the continual flow of incoming and clear orders gives the kitchen a time benefit of around 6–10 minutes compared to conventional fixed tills. With queues of orders in the kitchen avoided, guests get their meals quicker and even have time to order more. Orderman claims to be the global market leader of radio ordering systems in the hospitality industry, so we looked at The Magpie Café in Yorkshire to back up this claim and see how the Orderman improved this busy fish restaurant. Ian Robson, owner and chef, runs his business with a staff of 95, including 30 waiters and a kitchen crew of 40. There's no downtime here with seats being fully occupied during service all day. To allow maximum table rotation and ensure that guests are served as quickly as possible, Ian decided to use Orderman. He says, "When we open in the morning, there are often 130 guests waiting outside, and they all want to be served at once. My goal was to speed up service so that we could boost sales. Now the Orderman handhelds allow us to split up the tasks more effectively: the waiters can spend much more time with the guests who enjoy faster service. As a consequence, they free the table earlier for new guests or they consume more." It wasn't long before there was a noticeable improvement in the quality of the service either, Ian added, "The Orderman greatly reduced the number of mistakes with orders. Not only are there no more incorrect orders, but the cooks in the kitchen do not have to spend any more time deciphering someone else's handwriting. We now offer our guests a far more personal service because the waiter is always available. People leave our restaurant as much more satisfied customers." As part of our review, we have found out some must know advantages and disadvantages of Orderman. Runs via a purpose built, highly reliable radio system. Hardware comes with an all inclusive 2 year warranty, with an optional 5 year upgrade. High durability that can handle split drinks and being dropped 30 times or more. Long battery life that gives 18 hours uninterrupted service plus additional batteries can be purchased for no interruption of service. Handy belt printer prints bills and receipts at the table so the waiting staff can stay with the guests. Benefits any size business, improving standards whether there are 5 or 50 employees. The initial outlay for Orderman is quite expensive when you add up the cost of hardware, installation and software. However, with a decent amount of footfall in your restaurant the Orderman can easily pay for itself within the first year. Some customers are said to view handhelds as impersonal, however Orderman reports that in their study 90% of people found the handheld to look professional. The 10% of customers with a negative view of handheld may also go on to notice the improved service and change their minds. Unlike a smart phone or ipad, you can't use the handhelds for anything other than business operations, which is actually quite good for preventing waiting staff from getting distracted by social media. Installation of the Orderman needs to be done by the provider's specialist installation team, as it requires finding the right spot for the antennae. This is a simple task for such experts though. The arrival of Orderman might require some reorganisation of your business procedures and a bit of in-house training, however the positive outcomes should make this worthwhile. Management will also have to buy-in and manage the transition of using the new handheld device. Orderman is best placed in forward-looking, busy restaurants that are willing to adapt to best practice procedures and technologies; and who see the opening costs as small compared to the benefits. Each day, approximately 20 new restaurants seeking mobility, speed, friendliness, competence and profitability choose Orderman. Join them and get a quote today.